Imparting Grace: You never know what might happen. . .
You never know what might happen. . . Anybody wanna guess what this is? It's a photo of my left hand. Just for the record, I don't normally keep that attractive bandage on my hand. Last night, as I was industriously cutting a piece of cardboard with a very sharp box cutter--you know what I'm going to say, don't you? I'll spare you the gory details. Suffice it to say there are lots of blood vessels in your fingertips. 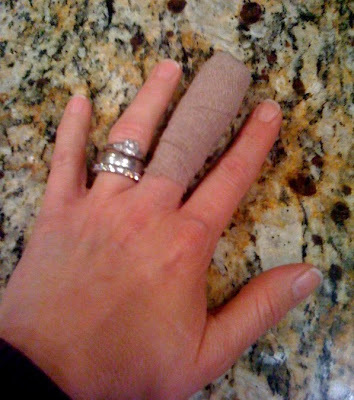 Two hours after the accident, after lots of compression and elevation, my finger was still bleeding. So how about you? Have you had a good day? so sorry Richella; hope it heals soon - and no pain. Oh NO!!! I HATE when that happens!! It will be a battle scar you can tell your children, grandchildren and GREAT grandchildren about!! Oh my goodness...I swear I just wrote this same post about 3 weeks ago haha! Bless your heart I know just how you feel. I am so so so sorry that happened to you! I'll bet it was scary! I HATE when I accidentally cut my finger!! How long before it is healed and the stitches come out? I just asked the Lord to heal you quickly! OH NO! Bless your heart! I am so sorry! I hope you at least got the good drugs. HA! Hope it feels better really soon! Richella I am so sorry. OUCH! I sure hope and pray your poor finger heals quickly. Ouch!!! I hope your finger heals quickly. Oh, you poor thing! I have had stitches too many times to count! I hope you heal up fast! Ouchy! Crazy... I just shattered my crock pot in my hands on Tuesday and got 10 stiches in 2 of my fingers! Must be something going on this week;) I hope you heal fast! take care... and let me look on the bright side: someone else is going to ahve to do the dishes!!!!!!!! Oh girl! I feel your pain!!!! You know those big paper cutters at school? I sliced my thumb with one of those bad boys on the day of our Christmas party one year! Be careful!!!!!! I wanted to let you know that I put your link on my blog as your mantle truly inspired me! I am so sorry to hear that! I can't believe that you went 2 hrs. with it bleeding! Hope you heal up quickly. OUCH! !~ Hope you have a quick recovery. I know better than to use a box cutter, I would cut my whole hand off...ME BAD! Ouch! That must have been painful. Praying it heals quickly! Oh no! I'm so sorry. I hope it heals quickly. Oh dear, I'm so sorry! Oh, Richella!!! I'm so sorry! So...I feel (actually felt) your pain, girl.